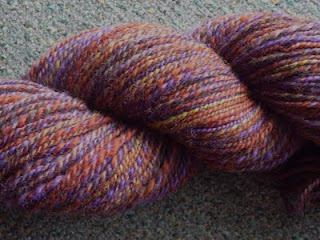 Handspun yarn, corriedale I think, just because I could. I really want to get a warp on the compu dobby and I have a plan. 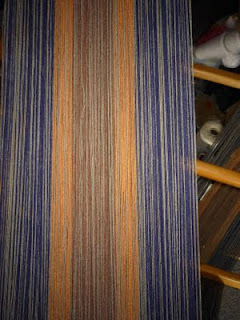 I have a 7 metre warp woven and dyed so long ago I can't remember doing it but its variegated and every alternate thread had taken the dye less intensely than its mate so I've been thinking how can I make use of this anomaly. Echo weave? I've gone for an interleaved threading but I've never done one before so I went to my "ugly box" and found some cotton threads and thought I'd whip up a few kitchen towels and see how it works (picture above) then I can tie on the next warp. They didn't look too bad when wound on the reel. Some of those cones I've given away and they come back unwanted! Last night I got to try the first 20 threads using the dobby to "treadle the threading" as there is no way my tiny brain can remember more than 2 numbers in a row. This method makes it very easy but I couldn't see where to place the threads in the reed so its a daylight job. 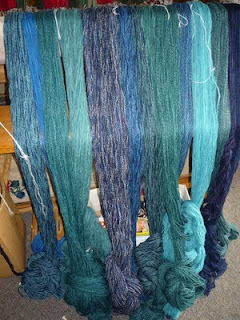 And this is another warp for yet another blanket, and a cushion this time. 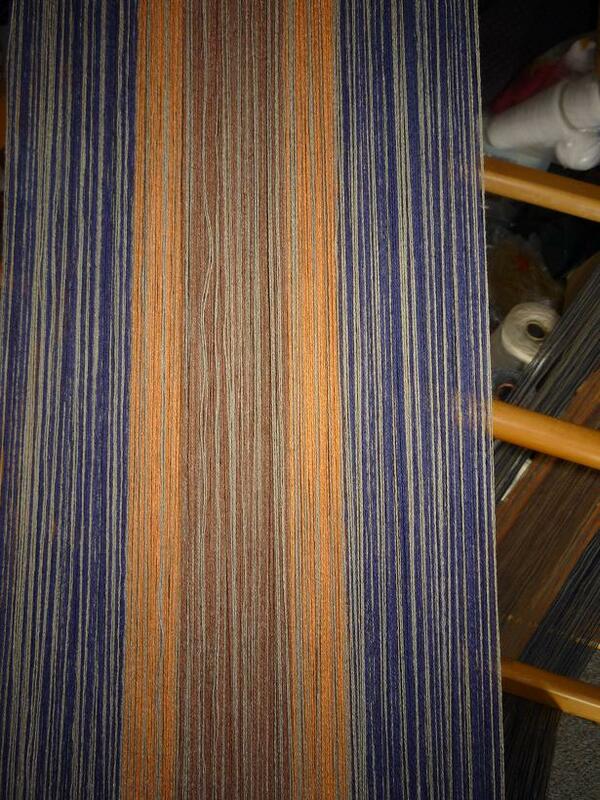 It was actually tied on and wound on the loom yesterday so ready to go. Unfortunately we do have to eat so its off to Tauranga today for a big food shop. At least we're past the shortest day so spring and summer to look forward to. My eyes glazed over when you said the top pics is of a handspun skein. I need a lie down now, and hot choc, please. Hot chocie is always good, especially with a dash of .... whatevers available. Meg thats why I didn't want you to have spinning lessons. I've been spinning for 45 years and I can't make the lovely free, textural creations you do. Cherish it while you have it.